Martial arts uniforms and instruction manuals related to martial arts. Instruction in the field of martial arts; organizing and promoting, by way of arranging, tournaments and demonstrations of martial arts. 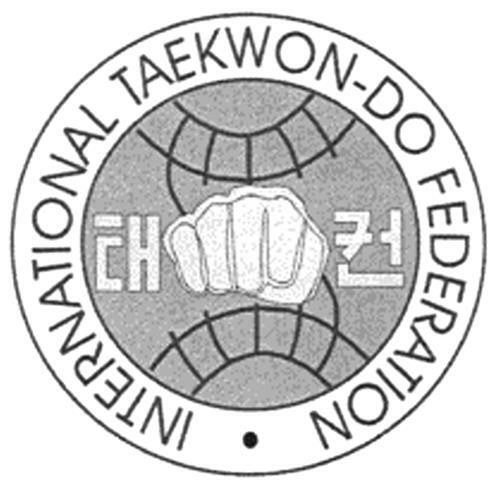 On Thursday, November 13, 2008, a canadian trademark registration was filed for International Taekwon-do Federation & Design by International Taekwon-Do Feder Yiewsley Leisure Centre, Otterfield Road, West Drayton, UNITED KINGDOM . The Canadian IP office has given the trademark application number of 1418237. The current status of this trademark filing is Registration published. The correspondent listed for International Taekwon-do Federation & Design is HEIDI JENSEN of (JENSEN & COMPANY), 2150 Thurston Drive, Suite 103, ONTARIO, CANADA K1G5T9 The International Taekwon-do Federation & Design trademark is filed in the description of Martial arts uniforms and instruction manuals related to martial arts. , Instruction in the field of martial arts; organizing and promoting, by way of arranging, tournaments and demonstrations of martial arts. .
(2) Circles or ellipses containing one or more other geometrical figures -- Note: Including circles or ellipses containing bent or straight lines (except 26.1.10). (1) - Martial arts uniforms and instruction manuals related to martial arts. (2) - Instruction in the field of martial arts; organizing and promoting, by way of arranging, tournaments and demonstrations of martial arts.